Hiland Cross Country had their awards night on Thursday, 11/2 at Hotel Millersburg. Receiving Mr. Cross Country was sophomore Tyler Kuhns. Congrats to Tyler and the rest of the team for a great season! This afternoon, senior Hunter Yoder (son of Marion and Laura Yoder) put ink to paper and will continue his education and Cross Country career at Mt. Vernon Nazarene University. Currently on the Cougar CC team are Hiland graduates Darian Pacula and Lorin Hershberger. Congrats Hunter!! From last Saturday’s district competition at Cambridge, senior Hunter Yoder was the only Hiland cross country runner to qualify in this weekend’s regional at Pickerington. Division 3 boys are set to run at 11am on Saturday at Pickerington High School North. Best of luck to Hunter as he tries to get to state! On Saturday, October 15th at Cambridge High School, Hunter Yoder set a new boys cross country record with a time of 17:07.49! 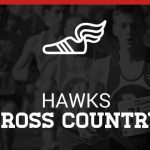 Congrats Hunter… and best of luck to all Hiland runners during districts on Saturday, October 22! 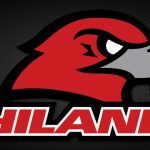 Hiland CC ran in the Wayne/Holmes Invite last Saturday, 10/10. Receiving 2nd Team All County Honors (and making history per Coach Mark Fowler) were Melissa Hostetler (18th) and Hunter Yoder (19th). Melissa is front row, second from left; Hunter is back row, 4th from left. CONGRATS TO BOTH! !